Product #16858 | SKU 4K2HD | 0.0 (no ratings yet) Thanks for your rating! 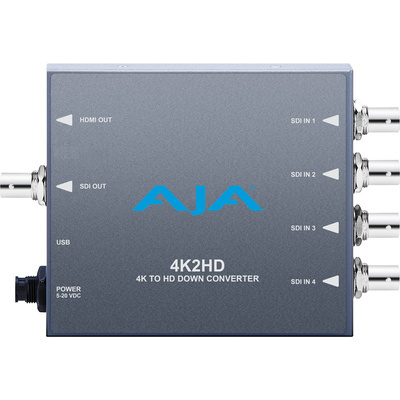 The 4K2HD 4K/UHD to 3G/HD/SD-SDI and HDMI Downconverter from AJA allows you to convert professional SDI 4K and Ultra HD signals to HD or SD resolutions. It outputs simultaneously to one 3G/HD/SD-SDI output and one HDMI output, allowing you to send the downcoverted signals to SDI and HDMI devices for on set monitoring or live broadcasting. The 4K2HD features four SDI connections for four 1.5GHz, two dual-stream 3GHz, and four 3GHz 4K (4096x2160) and UHD (3840x2160) input signals. It supports multiple frame rates up to 50 and 60 fps at full 4K resolution. The output signal will have a matching frame rate for accurate viewing of your footage. The 4K2HD also supports HD and NTSC/PAL SD input signals, allowing the device to function as a 3G/HD/SD-SDI to HDMI convertor. Configure the 4K2HD using AJA's free MiniConfig software for Mac or PC over the USB 2.0 connection. The software provides an easy-to-use graphical interface with detailed information about input and output formats as well as all configuration parameters. Additionally, external DIP switches on the device let you configure the V2Digital without computer access. A universal 5 VDC universal power supply comes included.